I always find it amazing how painting something completely changes the look and feel of whatever is being painted. Paint can makes things looks bigger and brighter, or dark and sultry. It’s all up to you, the painter. Today, I wanted to share with you this distressed white round mirror that I painted, & show you how to get this look. Together we will transform this bronze-colored mirror to a beautiful white, using a little distressed method that I like to do. So, where do we start? Choose a mirror that you don’t mind changing up (buy one) or one that you’re just simply tired of looking at in it’s present state (one that you already own). The mirror I painted is from Hobby Lobby……and even though I still think it’s a beautiful mirror as is, I was just ready to move the style/décor of my house into a different direction. If you wanted to do this mirror, it sells for $139.99 full price . You can wait for the 50% off sale that they do every other week or use their 40% off store coupon, and the price goes down to roughly $75-$85. Just a FYI- I had this mirror for about 5 yrs, so it was something that I didn’t mind changing. It all depends on what you want to spend (or save). Most of my supplies for this painted mirror project came from Home Depot and Ace Hardware. Both of these stores are close to my house, and convenience when painting is a huge factor for me. I also use Sherwin Williams for paint color choices, just not on this project. Here are some pictures of the supplies with prices to give you an idea of cost (at Home Depot). Remember that all of the supplies can be used for several small projects & you can choose whatever brand/store that you like. If you get these Behr paint samples (above pictures) at Home Depot, it will help keep prices down. They come in 5 finishes, but I typically use matte flat or flat when painting items. You can always get sample sizes at Sherwin Williams also. So you have chosen your mirror, purchased your supplies, and now ready to fill in that outer layer of the mirror. So here is what the outer rim looks like…..kind of like leaves or vines. Since it had more of a traditional look to it, I decided to change it. This is where the gloves, nail hole filler, and TIME will come into play. Cut a pretty good chunk off the tip of the tube of nail hole filler so that MORE comes out. This is important because it will take less time filling in those vine-y areas. Put your gloves on and start squeezing the tube so that you can fill in that outer area with the pink “goo”, just to the amount you desire. I covered about 1/2 to 3/4 of the vines (just enough so I could not make out those lines exactly……just a personal preference really). Smooth it out with your gloved fingers, and rinse gloved fingers off when it starts to dry. This will be time consuming and messy….maybe an hour or more. What I love about this kind of filler is that it starts out pink when wet, and turns white when it is dry. Takes the guessing out of it. Let dry for 24 hours. If there is still some areas with slight pink in color, don’t worry. It will dry by the next day. Begin priming the mirror with one of your paint brushes, following along with the lines of the mirror. Do not completely cover mirror with primer so that it is solid white – should have some dark streaks in it. You can see the streaks here (in it’s final state). Let the primer dry 2-4 hours. Now add your gray paint and follow those same brush strokes so that you can see just a little white peeking through in some spots. Let dry overnight. I used (Cathedral Gray- gray paint by Behr) and (Polar Bear- white paint by Behr) for this project. If you want other shades, I also like (French Silver- gray, and Swiss Coffee-white) – all at Home Depot. See Below -the picture on left show differences in shades of whites, the picture on right shows difference in shades of gray. THIS IS IMPORTANT, DO NOT SKIP. Take your clear wax and spread all over your mirror with a sponge or rag. Let dry 20 minutes- then dry off with a rag. It will have a light sheen after you do this. Waxing will keep the gray paint from coming off when you sand it later. Now you can paint the mirror with your white paint. Cover it completely with the paint- just not thick. Let it dry overnight. Use your clear wax again, wait 20 mins, and dry off with your rag. Now add your dark wax, and wipe off immediately…..leaving some spots with dark showing. I did mine with more dark showing on the vine-y filled outer layer to add depth. If you do not want any dark was/antiquing added, skip this step. Let dry overnight. Dry it off the next day. I got both of these from Ace Hardware, but here they amazon carries them also. They sell for around $15-$20 each. After you have dried/wiped off the mirror (from dark wax), do another clear wax coat & dry off. NOW- You can begin sanding immediately after your last waxing/drying off. Start with the 150 grit sanding sheets, and start sanding gently. Add more pressure if you want more streaks showing (distressing). Use the 80 grit (coarse) for greater distressed look and 220 grit (fine) for less distressed look). You can use your angled sanding sponge (optional) here to get in between those difficult spots/angles that the sanding sheets can’t get to. You will do the clear wax one last time- same method. Dry it off to get the sheen you want for your desired look AND…..
Good job and hope you love your “new” mirror!! So, we have finally moved back into our bedroom downstairs…..and I am so excited about how the entire bedroom turned out. The 2 things that “make” the bedroom and create some drama are the navy accent wall, and the white bed frame. And since I painted the bed, I thought it would be awesome to show you the technique if you want to change your bed also. Here is my master bed frame makeover – painted white using the dry-brushed technique tutorial. If you want a glazed or antiqued tutorial (like my nightstands)…..click HERE. Want to see my master bath makeover, click Master Bathroom Remodel: Hardware Bling. Put your primer on in long brush strokes, making sure not to cover your bed in a solid paint color. See below. Do the same technique for footboard and side rails if you have them. Put your first coat of white paint over primer in long brush strokes again, but this time covering more of the wood. You should be able to notice that the paint covers better than the primer, and it should feel thicker as you brush it on. Just make sure NOT to cover the wood completely. You should still be able to see brush strokes. BELOW: Headboard 3 coats, Footboard 2 coats. Can you tell how the headboard has more coverage on it than the footboard? ***TIP*** This is the stage/step where I go back and add in some paint to cover certain areas that do no look as even. This is just personal preference for me. Now you can put on your wax, let dry, and rag/buff off. Put on more coats of wax if you want a shinier finish- just fyi. Use your 150-grit sandpaper or sponge and gently sand over random areas where you want some original wood to show. I like my sanded areas to be over the ornate “leaves” sections to accent the details, and then over the corners where the bed would naturally get “bumped”. I also added some sanded areas in the middle sections of the headboard and footboard to move the eye around. ***OPTIONAL STEP*** WAX OVER SANDED AREAS. I like to do this just to bring out the wood tone (the wax makes the wood tone darker for more contrast) against the white paint. But of course, this is your bed, so it is your decison!! TIME TO PUT YOUR “NEW” BED INTO YOUR BEDROOM!!! Hope you love how your bed turns out….as much as I love mine!! Let me know how your progress is going- or if you have any questions? I would love to see some pictures of your bed too!! I really feel like I got new furniture…without the high pricetag!! Plus the white really lifts the room so much more than the stained brown color, and it gives me the contrast I need against the navy wall. Don’t cha think ?? Since whites have a hint of another color added – you can see the subtle shades of yellows, browns, grays, greens, etc in the picture…. that is what the undertone looks like. I see a hint of pink…what do you see? Take hardware off, and put to the side for now. I had to tape off my marble top, but you will not need this step if you have a wooden top until STEP 4. Put your canvas drop cloth down, and set up your wooden blocks first. (As you can tell from my garage….I no longer put a drop cloth down. But you should -LOL ). I primed these using the Zinnser primer – one coat only. I did not completely paint these solid with the primer, so it will have some brush marks in it. This is my personal preference. (It makes more grooves like real wood would have, instead of a flat, smooth finish). Also prime the portion between the drawers and sides of where the drawers slide in…..see pictures below.. Let Dry Overnight. ***TOP PORTION TIP*** If you have a wooden top, prime it also. Make sure you fill in ALL crevices if you want to do the glazing/waxing part. And prime the drawers….paint in horizontal (longways) brush strokes . Prime your TOP section last. The one coat of latex paint should cover more than just the primer. You can see below LEFT that the corner section is painted, but the side is primed. In the picture on the RIGHT it is completely painted. Let Dry Overnight before glazing. ***TIP*** Let Dry 4 hours before adding black paint to TOP *** (I did not have this step, but wanted to make sure you let the white paint dry before adding black paint to top). Below right painted, below left primed only. Both painted with drawers below. Paint top with black paint (your choice) to get the dark top, white bottom two-toned look like mine. It will go over primer. How many coats? One coat – if you want a charcoal- grayish look. Two coats – if you want a darker black look. Use that same 150 grit sandpaper sheet/sponge and sand around edges of nightstand feet, corners of drawers, and a couple of random areas that would get more wear and tear. I also sanded my drawers in a horizontal direction to create lines on my drawers. I like a messier look to my furniture, so it is your choice. ***TIP*** If you have a wooden top, sand around the edges in corner spots, and then on the top piece if you want a more distressed look. ***TIP*** Do not sand (leave solid) if you want a clean, smooth top. I used the Rust Oleum Java Brown Glaze, and put it on with a 3rd paint brush or glaze/wax brush. (You could use the Howard Dark Oak wax or another dark wax here if you prefer another color.) This java brown has a golden tone in it, and it was the “look” that I needed for this painting method. Work in small sections….I chose a portion of the side panel first. Brush it on quickly – cover it all– then quickly rub off in small circular strokes with your t-shirt rag (or old t-shirt if you have one). These t-shirts are nice and soft and take off the perfect amount of glaze without leaving “scratch” marks. Let Dry Overnight. FYI *** I did not wax first before I put my glaze on….like I normally would *** This is so the glaze actually changes the color of the paint – see picture 2 below. The pictures below – right one is glazed, left one has not been done yet. You can see the “golden” tint here on right. Using your yellow sponge, get a little clear wax and begin to wipe wax on with circular motions. ***TIP*** After I put the wax on, I very lightly go over it with the sponge in straight lines, so that it does not dry in the circular patterns. The wax dries in about 15 mins, so try to put the wax on in small sections. You will notice that some of the glaze is coming off a little, and that is normal. Once you do finish the first nightstand, go ahead and wax the other nightstand, drawers, and tops. *** Immediately after you finish everything, take a new, clean rag and wipe everything down. ***TIP*** You will begin to see a shine appear as you continue wiping. At first, it will be more difficult to wipe (feels thick), but then will get easier as you are taking more wax residue off. You are basically buffing your nightstands. .Go ahead to the next step- You do not have to wait overnight for this step. Go back and put another LIGHT paint coat on with your swiss coffee paint. When you dip your brush into the can, don’t get a lot of paint on the brush. Start with a smaller amount and paint over your waxed nightstand. It will go on very smoothly because you just buffed it with your rag. ***TIP*** You can control how much paint you want to use to cover some of your glaze. How much white do you want to show? If you want your nightstands whiter, add more paint. If you want a more glazed look, use less paint on this part. FYI- I wanted mine to be whiter so it would look “aged” more naturally in the crevices. Let Dry Overnight. Can you tell how the bottom picture has a more “golden” tone than the top picture? Keep adding paint until you get the shade you like. Lightly sand over those spots you have already sanded…..just enough to uncover some of those areas that might have been painted with the second coat. Should just be a touch-up. The top section does not need more sanding. Do the clear wax one more time, and buff again. Same as step 7. Go ahead and take the painter’s tape off and wax the TOP section again. It will need additional protection. Put down your plastic, and lie your hardware front side up on something to lift it up from the ground. I always use some extra pieces of boards that I have left over from other projects. Spray with the Oil Rubbed Bronze paint…..let dry at least 30 mins. Turn upside down and spray back side….let dry 30 mins. Turn back over to right side up again. Let Dry Overnight or wait at least 2- 4 hours. FYI – there is so much hardware because I was painting my dresser at the same time. And it has a ton of hardware. See below for a sneak peek of it. Picture below is front side up – sprayed. Picture below -has one side front side up painted (right), the other side flipped to the back side not painted (left). You can see the original goldish color on the back side. Now….go back and spray lightly one more time with the right side showing. This is just a touch-up, but important to do. Let dry for an hour and put back on your nightstands. ***TIP*** When you spray hardware….spray FOUR different directions. Spray upward direction, downwards, right, and left. The worst feeling it to THINK you are all done and patting yourself on the back….only to realize that half of the hardware didn’t get sprayed. You then have to take the hardware off again, set up your prep area again, spray again, let dry again, and then put back on AGAIN!! Trust me….it’s just worth the trouble to do it right the first time. That is why I turn mine upside down….because you spray other angles that would not have gotten sprayed right side up!! YOU ARE DONE MY FRIEND!! Bring out the champagne and celebrate….CHEERS!! Here is a sneak preview of my dresser that I finished. It is painted differently than the nightstands, so I’ll post that tutorial soon. When we get back into our house, and our rebuild is complete……I will post pictures of the nightstands in my Master Bedroom. Can’t wait!!! *** Shoot me some pictures of your “new” nightstands (or other pieces). I would LOVE to see your oldies, but goodies!! Have an Awesome Week and a Very Happy Easter!!! The Lord is Risen…..He is Risen Indeed!! So besides me, who is LOVING the white brick fireplace trend??!! It is just so clean and fresh, and can be incorporated into almost any home decor style. I love how the subtle texture of the brick blends with the smooth linear lines of the mantel to create a little piece of quiet drama. 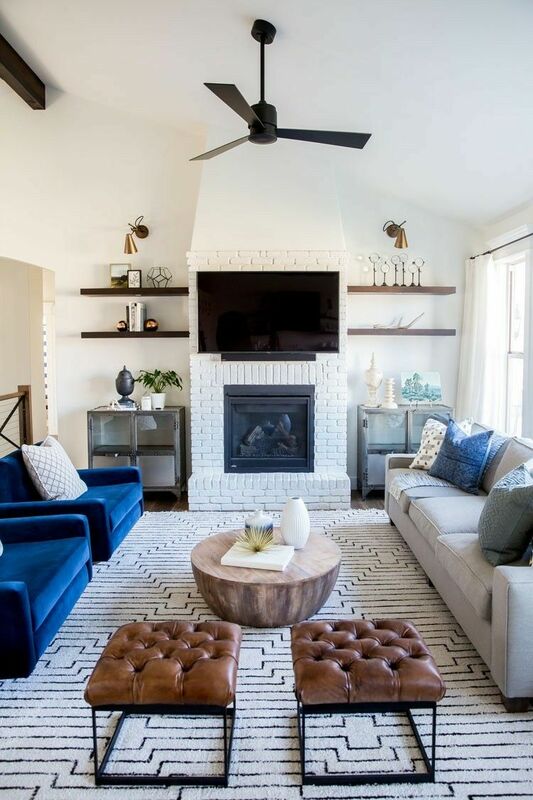 And since I just happen to be crushing on this white fireplace style, and we just happen to be remodeling our fireplace ANYWAY…….I thought I would share these 30 stunning white brick fireplace ideas and inspirational pictures with you (in case you are on the fence about having it done or doing it diy style). Since I’m loving ALL brick fireplaces right now, I thought I would break these up into 2 posts: white brick fireplaces (Part 1), and unpainted brick fireplaces (Part 2) coming soon. As you scroll through the pictures, you can tell how different all the styles are: modern farmhouse, coastal, boho chic, modern, cottage, traditional, and more. Each fireplace is also one-of-a-kind……don’t we alll want to say we have something “custom” in our house? LOL!! You can do a ton of different looks with the brick: change the direction of the brick pattern, layer it high or keep it low, use as a fireplace surround or as the entire fireplace, keep straight lines or use arches, etc. Plus if you already have it in your house (& it’s an ugly color because it’s from the 80’s) you change the color by painting it – like…. today!!! WOO-HOO!! ***If you are looking for more help on this as a diy project, scroll down to the end of the post for some tutorials. These tutorials are not mine or performed by me, but ones that I recommend for you to try. Hopefully, theses tutorials will help you decide if this is a diy project you can take on, or something that you should hire out. *** So, let’s get rolling…. Isn’t it great how the color and style of the mantel completely sets the tone and style of the room? It can be painted white for a crisp, clean (modern look), left natural (boho look), stained dark (traditional look), cedar (rustic or modern farmhouse look), hung with corbels (cottage), etc. The mantels can be prominent or subtle, and sometimes there is no mantel at all. The possibilities are endless!! As you scroll through these, you’ll be able to see the differences. And you’ll also begin to lean towards one or 2 distinct styles- right?? White fireplaces are not limited only to the indoors. Continue the fireplace theme onto an attached outdoor patio, a closed-in sunroom, or a detached outdoor kitchen/seating area. It will add texture to smooth surfaces like concrete and tiled floors, and will create a beautiful ambiance for nighttime entertaining. Can’t you just see the kiddos toasting marshmallows for s’mores while the adults sip wine? Oh yeah- I’m there!!! You can tell how the different shades of white paint colors (on the fireplace) change the mood and feel of the room. The brighter whites create a “cleaner” formal style (below), whereas the softer whites create a more “relaxed’ style (above). The height of the fireplace also changes the feel of the room. Lower ceilings and fireplaces lean toward a more casual style (above) and provide a cozier environment whereas as a taller fireplace adds more drama and sophistication (below) creating a more formal environment. BOTH of these rooms are extremely gorgeous…..it just depends on the look you are going for, and the mood you want to create for your home. The hearth also plays a huge part in the “feel” of the room. In the picture above, the fireplace does not have a hearth and is set up to provide warmth to the dining room. It doesn’t need to invite guests to sit down and relax, because they are close enough to the fire while they are sitting in the dining chairs. In the picture below, the fireplace does have a hearth and is set up for a place to come and “cozy up” in the larger family room. The hearth is needed here to provide additional seating for larger groups of guests, and to provide an area to come “warm up”, due to the larger sized room. Once again…just depends on the function and style of your room. Notice the arch in the picture above? I love the softness it creates when compared to all of the linear lines. It also adds an “old world” or authentic look to the fireplace-right? But don’t be fooled….arches can be incorporated into more modern fireplaces too (go back to picture 5). It just depends on what you do to the rest of the fireplace design that changes the style. Note the position of the fireplace position in all of the rooms pictured also. Some fireplaces are designed to go in the middle of the room, whereas some are off-centered (picture below) or positioned in the corner of a room. Some have bookshelves adjoining them, some have windows, some have walls, and some have open spaces (outdoors or two-sided fireplaces). Each fireplace has it’s own unique look- love this!! Don’t forget about the inside of the fire box either. The herringbone pattern (above) with the soft or dark yellows hues adds interest and character to a simple fireplace design. Want it to look more subtle, go with the lighter shades of yellow. Want more drama, go with the darker or brighter shades of yellow (like the last picture by Studio-McGee). It also creates a natural focal point, drawing the eye down away from the not-so-attractive TV!!! What will they think of next? All of these white brick fireplaces (and rooms) are just sooooo stunning!! So, which ones are your favorites? Difficult to choose…I hear ya!! If you would like to learn more about painting your existing fireplace white, read the tutorials below. It’s amazing what some paint can do to transform an out-dated fireplace. If you have existing brick on your fireplace that you have been wanting to paint white, read the 3 tutorials listed below (just click on the link below the picture). Each of these tutorials gives great advice and tips to help you through the process, and take your worries away. No reason to keep that ugly old fireplace anymore…..especially when painted brick fireplaces are on trend. Painting it will lighten your entire room, giving it a much more modern and fresh look, and will change the entire style of your room. Plus, it will be clean!! Ok- so who’s in?? Try it and let me know how it goes. Need some painting tips…..try Distressed Hand-Painted White Round Mirror DIY or How to Stain Banisters Dark with Java Gel. Here is my fireplace that they are working on. I’ll post “after” pictures when it is all done and painted!! Hi ladies! Just wanted to show yall my new FALL Dining room. really makes the orange pop!! And who doesn’t like a little drama? You can see my fall living room here and my halloween-fall foyer here. to the wreath and popped in a couple of the pumpkins to tie in the orange. I do have a slight obsession with mirrors- can you tell??? wink-wink. They make taking photos so much fun. There I am in the white mirror – lol! The lamp base, gray and white mirrors, white candle sticks, and table I hand painted. More on the white mirror click here. The candle sticks and ladder are from Round Top antique show….Round Top, TX. And of course my Boomer helping me. Today, I am finally getting to share our master bedroom home tour – woohoo! This room is still not completely finished, but it is getting closer day by day. Of course when that happens, I will probably be ready to change it again – lol, but for now it is working for us. If you love all things farmhouse, and your heart beats coastal cottage, then you are at the right place. Here it is! Home Tour: Coastal Farmhouse Master Bedroom. If you are joining in from Home Tour: Summer Dining Room or My Easter Tablescape: Blue & Yellow – welcome! So far, I have done a couple of posts on our master bed frame makeover: painted white and our diy nightstand makeover: painted white with dark top, to show you one side of our room. And now, I can finally show you the rest of our bedroom. I know there are some things that need to be tweaked, but at least it’s starting to feel more like home again. I will finish the bedroom tour with the painted dresser tutorial – coming soon!! So, stay tuned!! Accent wall Sherwin-Williams Naval – SW 6244 and the side walls are Silver Strand – SW 7057. So, what is coastal farmhouse style anyway? Coastal farmhouse style is really a “feeling” rather than a “look.” Huh? What does that mean? It is the feeling you get when you walk into a room versus what the room actually looks like. So, your coastal farmhouse bedroom will look a little different than mine. It might look similar, but feel different. What’s the secret then? Use the 10 elements below to make it personal. Before we begin the tour, I wanted to show you a couple of pictures of what our bedroom used to looked like before the flood (last day before we evacuated), during the cleanup process (2nd set of pics), and after (now). GOOD NEWS: The furniture was solid wood and we were able to save it. SAD NEWS: The water covered and damaged the feet, so we had to paint it. END RESULT: It was a blessing in disguise – we should have painted that furniture a long time ago!! You can see more of our house remodel by clicking Hurricane Harvey – The Destruction (part 1) and clicking Hurricane Harvey: House Makeover (part 2). So, who’s ready to begin the tour? Let’s first start off with the obvious – the painted furniture. It always amazes me what a fresh coat of paint can do – right? The painted bed and painted nightstands completely transform the dark furniture, and give the room an updated, fresh look. Plus, the white really pops off of the navy accent wall. But I do understand that not everyone enjoys painting nor wants to take on the challenge of painting furniture. If this is you, scroll down to the end of the post for more information on bedroom furniture ideas. If you want more info on the white-washed bed click here, or more info on the nightstands click here. Picture Below. This is my first time sharing our painted dresser (making it’s official DEBUT – lol) in the master bedroom, and I will post the white-wash tutorial on that soon. Do you like it? The white-washing technique gives it a beach-y, more casual feel and lightens up the darker furniture. Plus, the original color of the dark furniture blended into the color of the hardwoods, giving it zero contrast -yikes!! When we first moved into this house (14 years ago), we had carpet in here so the dark furniture looked great. Yep, that’s right – we’ve had that furniture for 14 years now. So, needless to say the darker dresser was waaaaay overdo for a LITTLE update anyway- lol!! Do you think I maybe should have been using a drop cloth all of these years when painting furniture – hahaha!!! But I have an idea for painting the floor in the garage soon – wink wink!! In the picture below, this is the other side of our bedroom. And I will admit, this is the stage it is in right now….. I have not finished decorating it yet. The master bedroom is always the last one to get done – am I right?? It comes right after volleyball lessons, teenage girls’ beauty items (don’t even get me started with that – lol!! ), and well…. life. Just keeping it real ladies!! Above: I did paint that floor length mirror blue (~ 8 years ago), but do not have pictures of the process – sorry!! It’s a water-color painting technique – that I love. I will try to figure out a way to show you the technique because it really turned out so beautiful. More pictures of the bed and bedding…..
All of my comforter selections tend to lean botanical, floral, or boho style. This way, I can stay within my coastal style (botanical or boho) and farmhouse style (floral) no matter which one I choose. This blue botanical bedding is Ralph Lauren, and has reversible stripes on the back side (which I love). This allows me to change things around when I get a little tired of it without having to buy something new. Win-Win!! And of course – I’m a color gal – so it’s gotta have some punch to it!! Scroll to the end of the post to shop bedding – I could not find this exact bedding, but found some similar choices that are equal in style. Closeup picture of the nightstand and farmhouse lamp. It is no longer around either, but scroll down to the end of the post for similar options. The little white basket on the floor was painted also….but again I do not have pictures. What?? Another one with no pictures. I know. I know. UGH!! It is on my to-do list for the blog though. It was so easy to paint, and gave it new life. What do you think – is it a winner? This bench is definitely a life-saver. It hides the tv cable “junk” (my husband wants to mount the tv on that wall above the bench – ?? – maybe ?? – we’ll see), and those 2 baskets store my girls’ swimsuits and favorite beach towels. They like to just come in and quickly grab what they need to head to the pool. But I am thinking it’s about time they could store their own stuff!! It’s the little things – right?? Here is another picture of the blue mirror and white basket. For now the mirror is leaning against the wall because we don’t know if the tv wall mount is a sure thing yet – hahaha!! The floor length mirror is a must for our bedroom though, so that we have somewhere to check ourselves out!! Plus, I really love that it bounces so much light around the room. This picture shows the left side of the room, leading to our master bath. If you want to see the complete transformation of the master bathroom makeover click Master Bath Remodel: Hardware Accessories. It is by far one of the biggest changes made to our entire house – besides the kitchen. Everyone who has seen it in person has given us a ton of compliments – so I’m kind of proud!! Check it out if you have time. And my must-have barn door…..that almost didn’t happen!! That’s another whole story – but at least we got it!! If you want to see more barn door inspiration click 55 Incredible Ideas: Not Just For Farmhouse Style. Our other entry door to the bath was a double door system, and blocked off the left side of the wall where the dresser sits. We always had to push the dresser down so that it barely even fit on the wall. Then if you wanted to get something out of the drawer, it bumped into our other furniture. Here is the picture before the dresser made its debut…..
We had the barn door installed to slide right because it was a space we never used (in that corner). ***TIP*** Just a little head up…..remember that it’s more difficult (not impossible though) to hang something on the wall where the door slides. So, just make sure you hang your barn door to slide to an unused area of your room, or unused/less functional wall area. And my favorite t-bar barn door handles….I kinda have a thang for these. They are my go-to hardware all over the house. But I especially liked this one because it is a heavier, sturdier handle. Plus, I knew we needed an inside way to get out of the bath -ha!! See below. Better view where you can see the limited amount of wall space on the left side of the doorway. It might also be that our dresser is bigger than it should be for the space…..but who wants to admit that? This celadon glazed pitcher has been with us for AWHILE….to say the least. I bought it at Home Goods ~8 years ago (or longer) and it just gets moved from room to room as I need it. There is just something about the soft color, and that rusted handle that calms my nerves and reminds me of home. And who doesn’t want their master bedroom to be a calming and serene retreat? This “love pillow” is another favorite of mine that gets moved from room to room. I also have a “home pillow” that is slightly more blue-gray than this blue-aqua color. The shabby, ruffled edges and roped letters add the perfect amount of texture to complete the coastal farmhouse style. And who doesn’t love throw blankets?? Can a girl ever really have too many blankets or throw pillows? No….I don’t think so!! In here, I like that one throw is more sophisticated in color (bed- spa blue) and the other one is more fun (basket -mint colored). These 2 colors together add a little dimension against the navy and cobalt blue bedding and pillows. Which throw do you like more? The one on the bed, or the one in the basket? Let me know? Home Tour: Coastal Farmhouse Master Bedroom!! Hope you found a ton of inspiration to get your coastal farmhouse master bedroom makeover underway. I’d love to see some pictures of what you do!! I am excited this year to be sharing our Easter table decoration with you! We were still living upstairs (due to the flood/remodel) last year during this time, so nothing was decorated. And honestly, it was quite depressing. Fast forward one year …. and what a difference!! I am feeling so blessed to actually have a dining room this year, that it was important that it looked special (well at least to me). And you know…..sometimes us mommas deserve to feel good about something too- ya know?? LOL!! My Easter Tablescape: Blue & Yellow. If you’re joining in from 26 Gorgeous Easter Tablescapes To Try or 24 Adorable Easter Front Door Wreaths, welcome!! FIY – I picked a different color palette than the ones mentioned in the 26 tablescapes post…..just to give you another option to try. I hope it gives you a little inspiration, and puts a smile on your face. 1) So, what sparked the inspiration for my color palette this year? The yellow pitcher and plates with retro style flowers were definitely the first items that came to mind. They instantly fill the dining room with yellow sunshine on cloudy days (& we have had A TON of those here in Katy, TX)….and they make me happy! 2) And then I found the muted yellow striped placemats, and that adorable farmhouse truck with Easter eggs pillow…… & I knew it was enough to get me started. So what do you think of the pillow – isn’t it precious? I found all of these goodies at Home Goods (in case you’re interested). 3) Now, that I knew which color palette I was using…..I began rummaging thru my “goodies” at home to see what I could use to tie these colors together. AND….what did I find? Well, I found the yellow wreath and robin egg’s blue table runner – bingo!! The yellow wreath screams “hello spring” right from 1st glance, and that quilted table runner brought in the vintage feel that I was going for. Yes, please – we have a winner!! 4) Plus….. I already had the geometric navy lampshades with white bases that really help the wreath “pop”off of the wall. With all of the lighter colors on the table decor, it was important to have the darker colors against the back wall for contrast. ***TIP*** The dark navy wall also adds a lot of depth to the room by giving the eye a large grounding space (resting place) with all of the different patterns and colors going on in the room. To see more of the lamp shades in my dining room click here for my Fall Home Tour 2018 (with orange accents), and here Christmas Dining Room (with red accents). Which one do you like more? Here is what the dining room looks like from a distance (picture below) so you can see how the navy accent wall adds depth to the table decor and room. Plus, it really creates a big contrast against all of the white slipcovered dining chairs. If you want to know more about the paint colors I used click My House Paint Colors. If you want to know where I got some of my items or want to try to get the same look as my summer dining room, click shop our home: dining room. Have a question about an item or can’t find something, shoot me a comment. I’d be happy to answer any questions. Now that I can see my main decor elements: lamp shades, wreath, yellow pitcher/plates, and pillow…..I can now start accessorizing. Since I already had the 2 turquoise, spa-colored pillows (from my bedroom), I popped those in to my captain chairs. They also help ground the busyness of the decor. QUESTION: Do you like the chairs at the table (picture below) or do you prefer them against the wall (picture above)? I just have to say that I am LOVING that cute little farm truck with Easter eggs pillow!! Can you tell – LOL??!! It just adds a little whimsy to the dining room, and plays off of the floral pitcher and plates. Plus, its just fun!! Now, let’s get to the tablescape accessories. Since I know my color palette and have my accent colors in place, I just have to pop in a couple of items to complete the look. Here is what it looks like from the top view. The design is kept simple in order to swap out a couple of decorations with a couple of serving platters, when Easter dinner is served. This way I can enjoy the tablescape for the entire Easter and spring season, but use it functionally when Easter actually arrives. Below is a picture from the side with the chairs turned out so you can see how all of the color accents work together. What draws YOUR eye first, then second, and so on? My eye goes to the back wall first – right? Then my focus travels from the navy lampshades to the yellow wreath, up to the yellow pitcher, back to the blue throw pillows and yellow farmhouse pillow, AND then back to the yellow plates. Amazing how it all interacts with each other! Since I am an “antique lover,” my mom gave me that sweet little vintage egg pedestal candy dish a long time ago. Most years I fill it with candy, but this year I decided to put dyed Easter eggs in it. Because she did those too (with my girls when they were little), it’s a perfect way to reminisce on both memories. One of those dyed blue Easter eggs still has a little “Disney princess” sticker still on it. Cry-cry, sniff-sniff!! It’s the little things …..
***TIP*** Use different shades of the same color to your tablescape or other vignettes, to add dimension. The different blue and green colors of the dyed eggs really pop off against the lighter blue table runner, and spa-colored napkins. Plus, they are in the same color depth as the blue on the plates…even though they are a different shade. I found those vintage style blue glasses (plastic outdoor tea glasses) to compliment my smaller antique glasses, and to add a little blue to the top of the table setting. I think it’s one of my favorite additions to the entire tablescape. What do you think?? Here’s another view of the table setting from the back side. You can tell how the white bowls, plates, and cake stand (all with dots) carry on the theme of those vintage inspired tea glasses. The dots really frame the dishes and give the setting texture. Front side…..the bunny dish we got from our “holiday” wedding shower – almost 17 years ago. Love the style of the mirror? Click Distressed Hand Painted White Round Mirror -DIY. There’s a painting tutorial and tips to get this exact look! Thanks for taking a little Easter Dining Room tour with me!! I hope you’re loving the blue and yellow as much as I do! Just remember to use things that you love, that are meaningful, that remind you of Jesus, and that make you smile. Do you like the color combination and items I used? Do you have a favorite? Let me know! !